A shelter worker knows to tuck in Prince every night. 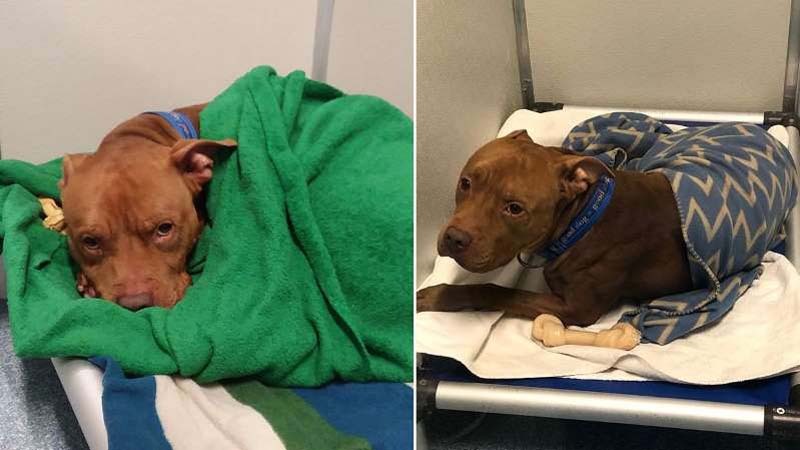 Getting tucked in every night is the only thing that gives Prince the pit bull comfort at this upstate New York animal shelter. Just before closing time at the Mohawk Hudson Humane Society, Prince will curl up in his kennel and wait for a shelter worker to wish him good night. “Every night at closing, if someone gets into his kennel and gives him a toy, he climbs right into bed and waits to be tucked in with a blanket," Mohawk Hudson Humane Society spokeswoman Marguerite Pearson said in a statement to InsideEdition.com. She explained Prince can get nervous at the shelter, but tucking him in every night helps keep the animal calm and situates him to his environment. Pearson said Prince was picked up by animal shelter in April. He was originally living with an owner that was unable to care for him, and then gifted to the owner’s girlfriend. While Prince and his new owner were out for a walk, he slipped out of his collar and ran away. “We followed up, expecting that she would come to redeem him, but she never did,” Pearson said. Pearson said they’re now looking to find Prince a new home, and spent the last several months training him to sit and drop a toy on command. “[Staff has] been taking him on outings and showering him with affection, which he loves. And he gives it right back,” she said. “He’s very smart and people-oriented."